The Temple of Heaven was the place where the Emperor of the Ming and Qing dynasties would worship heaven and pray for good harvests. Built first in 1420, and then expanded and reconstructed, the Temple of Heaven is a precious example of China's ancient architectural art and the largest architectural group for worshipping heaven in the world. The most prominent building in the temple's complex is the Hall of Prayer for Good Harvests. 38.2 metres in height and 24.2 metres in diameter, it is supported by immense pillars. 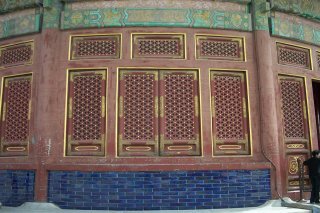 The painted roof has 50.000 blue glazed tiles and a golden point. Although it turned out to be a familiar picture, I didn't know anything about the Temple of Heaven before coming to Beijing. Probably because there are so many other good sights in China's capital. 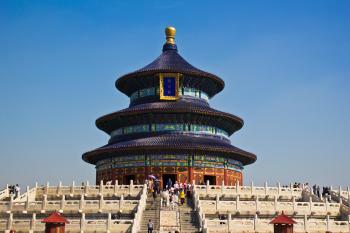 The Temple of Heaven is situated in a large park, that serves as a meeting place for the city's elderly. They have their badminton spots, their tai chi, their singing and their ballroom dancing here. It's fun to watch them, an it's easy to relax yourself here too. The temple buildings are very picturesque. It looks like they descended from heaven and were planted here to impress the people. The blue tiles on the Hall of Prayer for Good Harvests, and of course its peculiar shape, make a wonderful sight. If you're visiting the temple, make sure you give yourself enough time to explore the park around it - particularly if you can make it there early in the morning or in the late afternoon. The park is full of local people (many of them elderly) who come here for their exercise and games. You'll see martial arts, tai chi, games, singing, bands and much more. It's a lot of fun and it's completely authentic. It really adds to the visit to the main landmark. 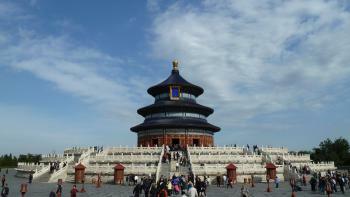 One of my very first WHS in 2006, the Temple of Heaven is one of the premier examples of Chinese architecture. The exquisite wooden structure is one of a kind, and the wide circular layout of the grounds, which include dozens of unique stone carved images along stairways, large swaths of green space, and on less busy weekdays an atmosphere of sacredness. Essentially, it is probably a key fact for any traveller in China: No Chinese holidays or weekend excursions to WHS, unless its well off the beaten path. Almost all of the Beijing WHS are extremely busy during weekends, and it just never quite does Chinese world heritage sites justice if you have to jostle for space! 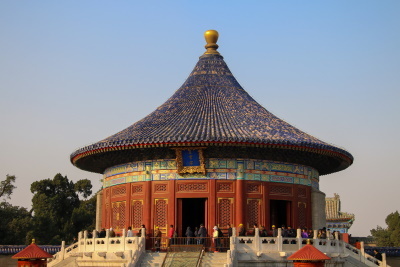 A key stop for any visit to Beijing, the Temple of Heaven is a WHS that preserves some of the historic fabric of Beijing that sadly disappears as each year passes. I visited this WHS in October 2013. This is truly one of China's landmarks and rightly so. The fact that the surface area is so large makes it easy to find ways to enjoy this beauty at your own pace and away from the crowds. Architectural bliss! Fresh off the plane I went for an early morning stroll around the Temple of Heaven and the surrounding park, which provided the best possible start to my 5 days in Beijing. I sat down with the tasty jianbing bought off a street vendor and relaxed watching the Beijingers go about their morning rituals whilst I celebrated the arrival of my little nephew Thomas. All in all the perfect way to start my trip. The temple buildings were very impressive, I would recommend starting from the south and working your way north, as this is the traditional processional route and the structures become more impressive as you go allowing you to finish at the magnificent Hall of Prayer for Good Harvests. Whilst I enjoyed the buildings the thing I most enjoyed was strolling around the park people watching. It was great seeing the old men doing water calligraphy, mass participation Tai chi, practice sword fighting and line-dancing to Europop. However the thing that most captivated me was the people who congregated en-masse to sing. It happened throughout the park but my first encounter with it was when around 1,000 people all gathered to belt out something that sounded like Opera. The sensation was incredible as people all just walked up and started singing in harmony, I had the same tingling sensation I get when I walk into the home stand of my favourite football team. I just wished I knew what they were singing as I would have loved to join in. As soon as the song finished the crowd just dispersed, it was a rather magical experience. I really enjoyed visiting the Temple of Heaven, the buildings were very nice however seeing Beijingers entertaining themselves on their morning strolls made this a perfect introduction to the city, and these early morning happenings were a real highlight of my trip. 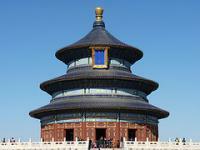 I have been to the Temple of Heaven twice. The first time I went there was a few months ago (April 2006) and I found that the main hall, (Hall of Prayer for Good Harvests) to my disappointment, was being renovated, perhaps something to do with the 2008 Olympics. When I came back, I could trace the scent of paint. The new hall was impressively fixed, although to be perfectly honest, it is a bit difficult to appreciate because it didn't seem authentic anymore. 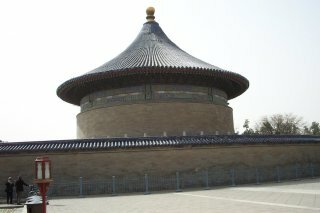 The main temple, Hall of Prayer for Good Harvests, is closed for renovations, probably in time for the Beijing Olympics in 2008. The rest of the area is not impressive, but the Fasting Palace with its huge moat is worth a visit, where the emperor abstained from pleasurable pursuits including food. There is also a charmingly named Hall of Divine Music Administration. Situated in serene Tiantan Park south of the Forbidden City, the Temple of Heaven is a classic Chinese icon, perhaps second only to the Great Wall. While there's much traditional and religious meaning behind it, I was more impressed by the artful architecture and engineering of its construction. Then again, everything "Emperor-related" was quite nice, as one would expect of someone bearing that title. I visited there in 1992. There are 2 kinds of tickets at that time. The foreigner ticket was 10 times more expensive than the local ticket. I bought local ticket but I couldn't enter to the alter. Anyway, I still visit the garden outside the alter. 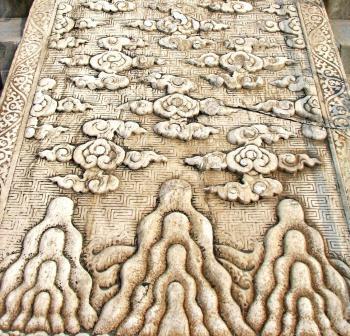 The Temple of Heaven and its surrounding park is a magical place. The temple itself is unsual and beautiful. I would also recommend visiting the Fasting Palace section of the park. It is less restored and virtually free from visitors. 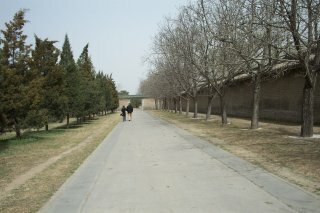 You can get really close to old Beijing at the Temple of Heaven, but you have to get there early! Me and my friends were tipped that large numbers of old Chinese retirees (about 400 and above) congregate in the Temple of Heaven park's Southern Gate, opposite Hongqiao shopping complex. Go there at about 5.30 am, you can mix in with the crowds without paying, and watch them practicing swordplay, Beijing opera, tango in the old faded Ming-style corridors. It is a very magical sight. Better still, at about 7.30am in the morning (depending on season), wait for the ticket booth to open, buy the first ticket and rush in! You will have the entire Temple of Heaven complex to yourself, and we got a taste of what it was like for the Emperor, the sacred silence, the sanctity of the site, all to yourself before the crowds start coming in minutes later. It's worth it, but my best memories are still that sprightly middle aged man and his young dance parter prancing the foxtrot along the ancient corridors, surrounded by streaming rays of morning light. Magic! 404 Community Members have visited.